Five Kitchens Transformed Beyond Recognition! 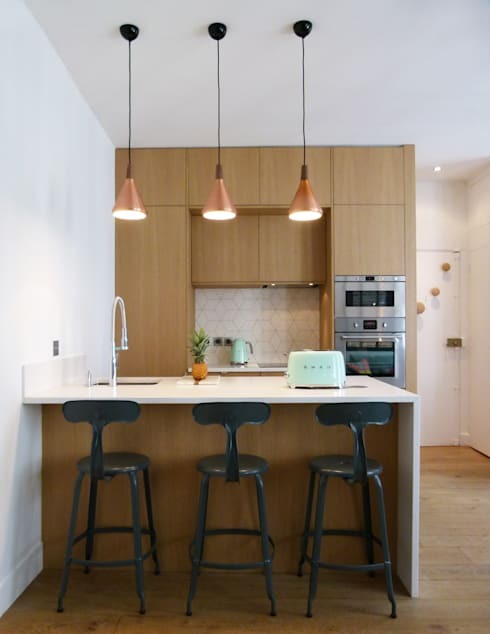 Apart from the exterior facade of a home, the kitchen is one of the most important spaces and can really change the while look and feel of a home once it has been transformed. It's the room in the house that is used most frequently and therefore, undergoes more wear and tear. This is why our kitchens often need a bit of maintenance and some tender love and care more often. It needs to remain functional as well as aesthetically pleasing. In this ideabook, we are going to show you five fantastic renovations to small kitchens. 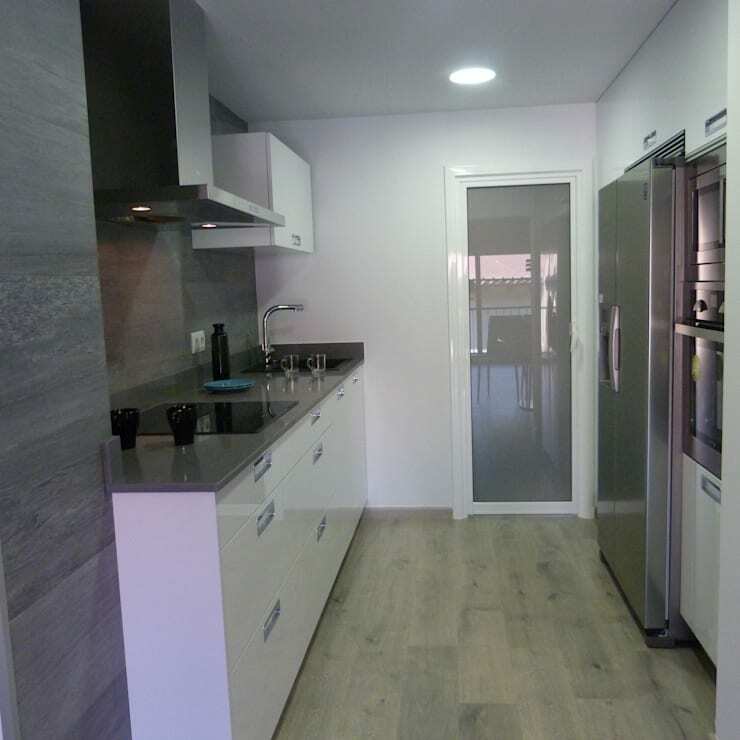 We will witness kitchens that have grown and expanded as well as kitchens that have merged with other spaces in the house like the dining room or the living room to create a bright, spacious and trendy home. In every single case, the kitchens have been modernised and filled with light, creating a whole new home that is inspiring and beautiful. Doing the dishes will never seem boring again. While this kitchen doesn't look like a total dump, its style is outdated and it is not very functional. It is very enclosed from the rest of the house, is small and lacks light. The opaque tiles that were once fashionable a couple of decades ago are just as outdated as the orange wooden cabinets. The cupboards, which have been built into the corner of the room, are not as practical as they look because there is just not enough space. 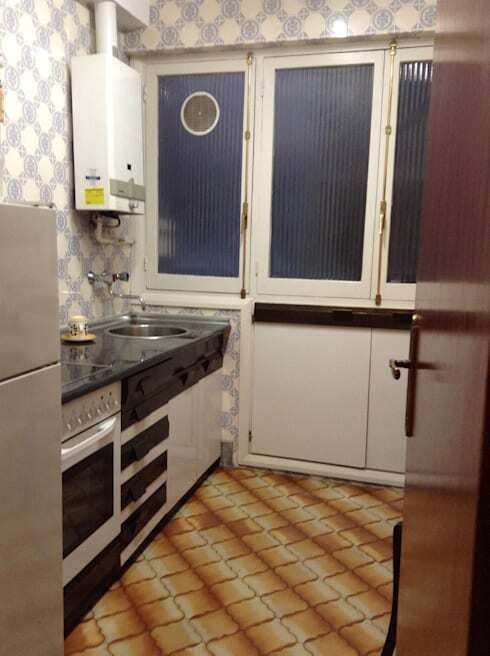 The impression that we get of this kitchen is that it is cramped and claustrophic. How can you cook anything in this space? How phenomenal is this design and transformation, by Transition Interior Design? In the above photograph, we saw how the design of the kitchen was locked off from the rest of the home as a tiny little functional room. Now we can see how this has been renovated to merge the different environments, achieving perfect harmony between light, colour and space. The result is wonderful! The new kitchen utilises every centimetre and despite it being tiny, it remains spacious and full of light. Thanks to the smart storage solutions, all of the utensils, crockery and cutlery are stored out of sight. The built-in appliances don't have exposed wires—this creates a very neat and minimalist look. Have a look at these cool simple storage solutions. There is also a large breakfast bar with a white surface that is trendy and chic. These are enhanced by three bronze lamps that hang from the ceiling. This is the perfect spot to cook and eat! This home has a special feature: part of the home is below ground level so any renovations or refurbishments had to take this into account so that adequate ventilation and lighting is achieved. The kitchen looks very dark and the large windows are covered with ugly curtains that don't let into any light pass into the room. The outdated and dingy design does not enhance this space one bit. 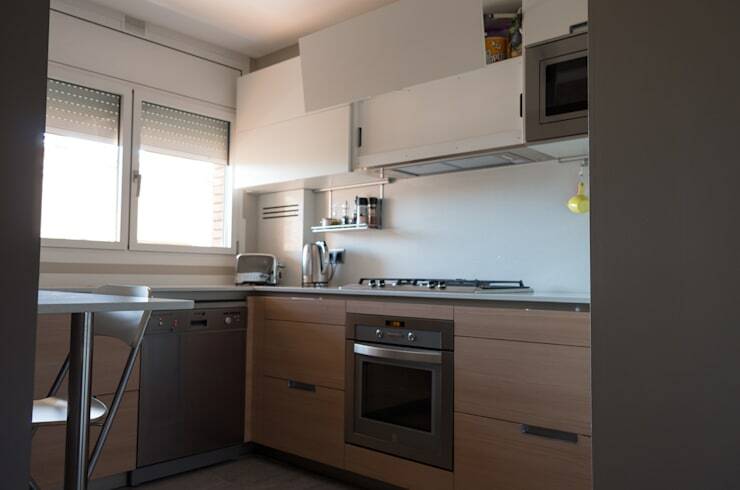 The white counter tops and tiles are yellowing, dirty and dull while the areas that are covered with wallpaper are tatty and haven't been applied properly. Have a look through the homify kitchen products to get a real sense of what your kitchen should look like. 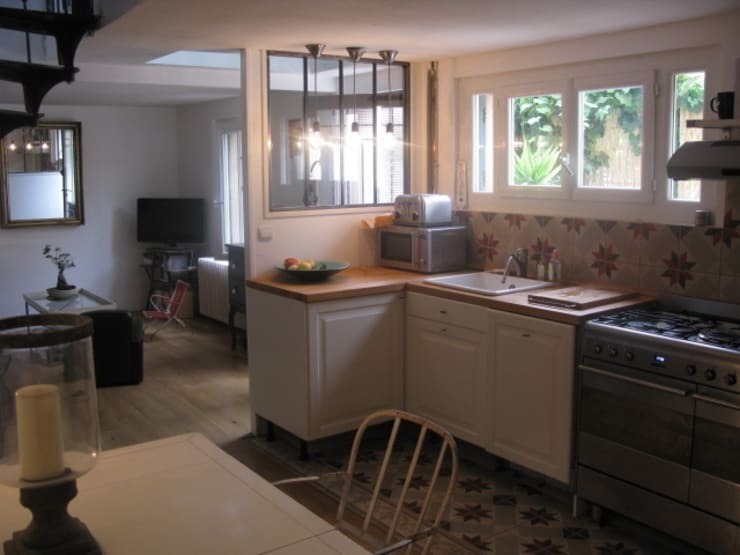 In this transformation, by Alice Bizien, we can see how the kitchen is far better utilised. The transformation of the tiles, furniture and floors have created a very cosy and warm kitchen that is inviting—this is a real chef's kitchen. The windows that were once dark and protected before are now transparent and allow light to cascade into the space. There is a new, modern and trendy wooden counter top, which looks elegant and rustic at the same time. This creates a very homely and intimate touch to the room. 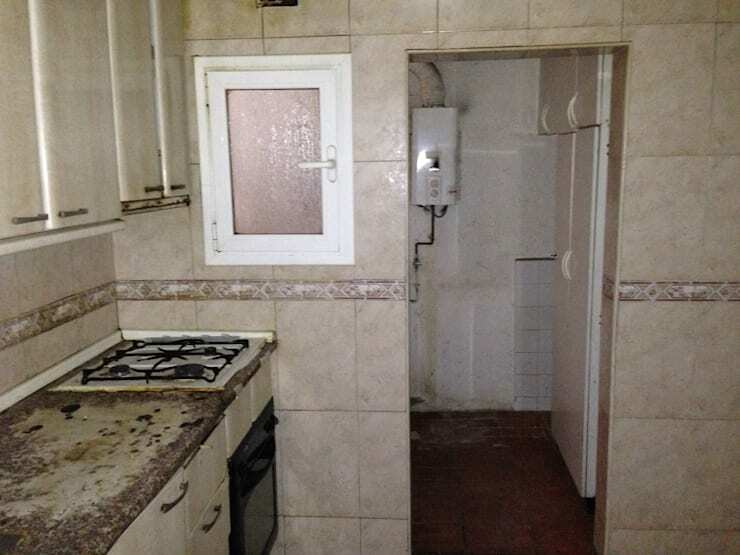 This small kitchen doesn't look too pleasant. The floor tiles and wall tiles clash with each other, along with the old-fashioned windows. 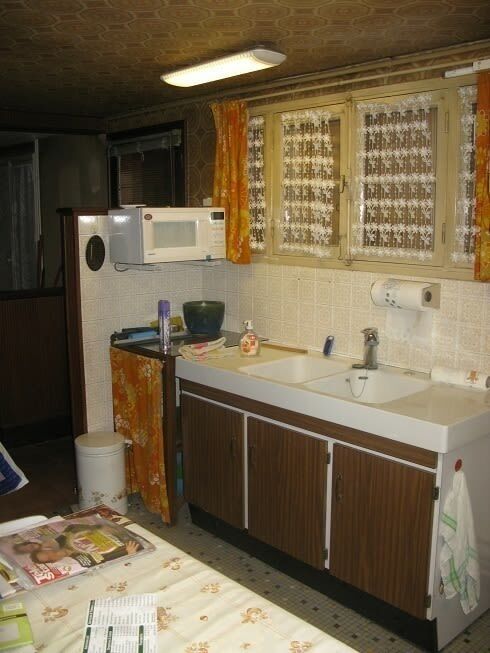 The black and white furniture and the boiler above the sink is very tacky and old-fashioned. An urgent change is needed in this kitchen! 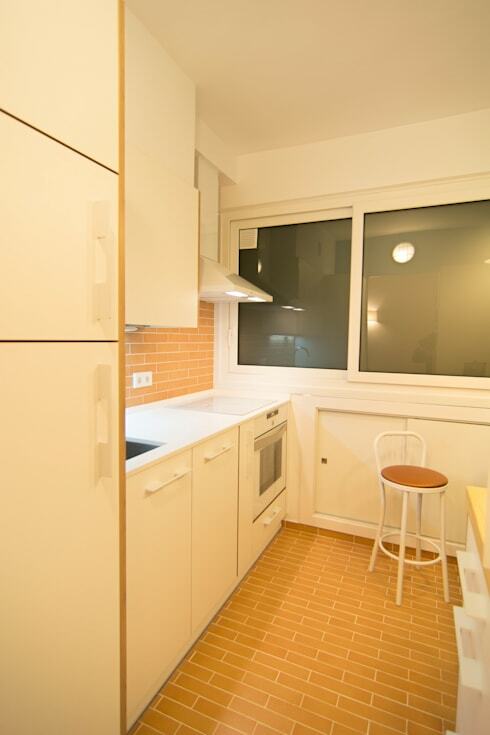 The new kitchen has been completely renovated but maintains the same space. The stove has been positioned at the edge of the counter, leaving the sink and clean, modern cupboards and counter tops exposed and neat. The ugly cupboard under the window has been changed into a modern unit with two sliding, gleaming white doors, keeping the crockery, cutlery and utensils out of sight. The floor design now replicates the wall design, created with a faint apricot colour that emphasises the warmth of the place. The white counter top surfaces, doors and cupboards create a feeling of spaciousness and a very clean look and feel. Before the renovation, the kitchen elements look piled up and crowded, divided into two spaces connected by a narrow corridor. There are chairs and kitchen appliances cluttering up the small space. The cupboard space also doesn't seem to be enough because there is crockery and cutlery everywhere. The different colours and tones all over the place don't help the design. Something needs to be done! The kitchen has now been integrated into a single space, with the cupboards redesigned. The colours and design of the space is also now uniform and neat. The flooring has been finished in a light wooden material, while the counter tops and cupboards are finished in a gorgeous white design. The large glass windows allow an abundance of light to stream into the room. There is a series of modern finishes and stainless steel appliances, which creates a very new style that is flawless and functional. 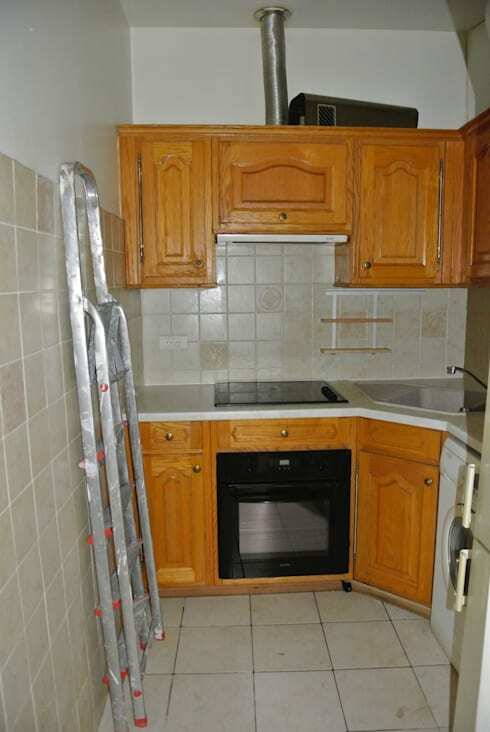 For anyone to live in here, this kitchen needs to completely renovated and quickly! The walls are dirty, the stove is very unhealthy and rusty looking and the floors are in very poor condition. And this is just the first appearance. What about the electrical, hydraulic and gas installations, which could potentially be very dangerous! Can you believe this transformation by: Renova Interiors? The start with, the doors and walls that separated the service area from the kitchen has been removed. This has expanded the area, while the opaque glass door allows light to enter into the space discretely. The counters and cupboards have been completely replaced and installed across the entire length of the room, maximising the linear distribution. The appliances have been embedded in the wall opposite the counter tops and cupboards. This allows those using the kitchen to move effortlessly through it—a functional and fluid use of the space. The white cupboards, shiny and grey granite counter tops, the porcelain grey walls and the light wooden floors finish the kitchen off beautifully, creating a space that is not only practical and functional but also elegant and beautiful. Which transformation is your favourite?